"Binta and the Great Idea" ("Binta y la Gran Idea") is a 2004 Spanish-Senegalese co-production short film by writer-director Javier Fesser. The film stars Zeynabou Diallo as Binta, Agnile Sambou as Binta's Father, and Aminata Sane as Soda. The film duration is approximately 31 minutes, with dialogue in Diola and French. The film is included in Oscar Nominated Short Films by Magnolia Pictures and Shorts International; the theatrical release of this collection was February 16, 2007. This film was made in collaboration with UNICEF, to which 100% of the profits will be given. Binta is a young African girl who serves as the narrator. She talks about her father and his 'great idea'. 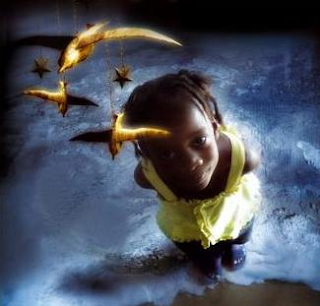 Binta's father is a small-time, local fisherman in a peaceful village in Senegal. His friend who recently visited Europe describes what fishing is like there. He tells him that the Europeans can catch thousands of fish with bigger boats equipped with sonar. The man, very impressed by this, encourages the father to approach the government and request a permit for a bigger boat. Binta's father also hears from his friend how once he attains wealth he must get a permit for a weapon so he can defend his wealth. The friend also shows off his watch which has an alarm set to ring every day at noon. "What happens at noon?" asks Binta's father. "Why, the alarm rings!" his friend replies. Binta's father is shown making his way up through the ranks of government, sharing his great idea with various officials. The film switches back and forth between the story of Binta and her father and the struggle between Binta's cousin, Soda, and her father, a village elder. Soda desperately wants to go to school, but her father believes African girls should not be educated; they should learn to tend the home and then get married and tend to home and family. The village school children put on a play to convince Soda's father to let her attend school. Here we experience the power of art and solidarity; in the end, the father is finally convinced, and Soda is allowed to get an education. Finally, when Binta's father meets with the provincial leader, we find out what his great idea was: He wants do his part to make the world a better place by adopting a tubab (white child), "preferably weaned," in order to teach him/her qualities which Western industrialized society has largely lost, such as sharing, solidarity, the sustainable use of resources. This film is unusual in that it allows us a glimpse of Western culture as viewed from a third world perspective. Various themes are touched upon in this delightful film: the power of art to bring about change (see both the play-within-the-film and the film itself), sustainability and equitable division of resources, and the true meaning of progress and humanity.